The Battle for Pilning goes back at least to the mid/late 80s, by which time the once-bustling station’s service had dwindled to one train each way daily (except Sundays). Moreover, this was of little practical use to anyone as the solitary train from Bristol called in mid-afternoon – useless for anyone returning from work or college. This was because the station lighting had been disconnected as it had been declared unsafe, meaning trains could not call after dark. Local resident Jonathan King decided to do something about this and began a campaign to get services improved. 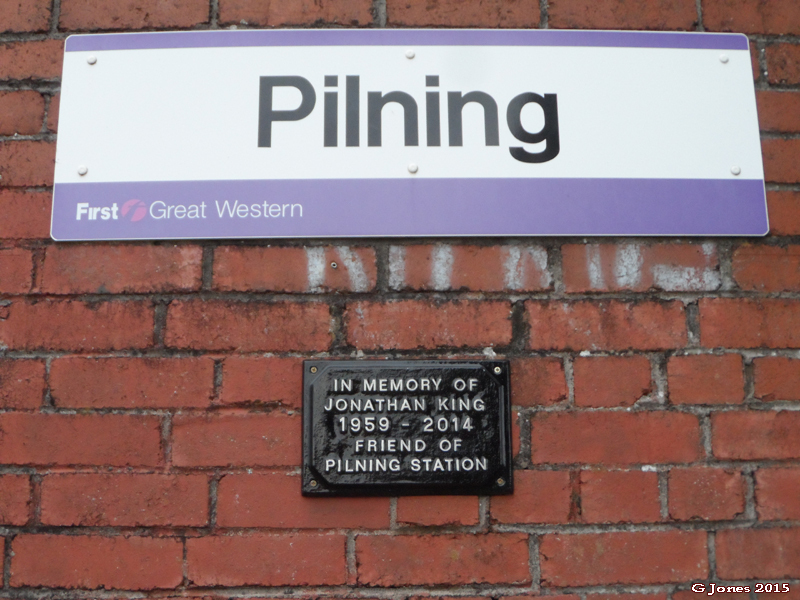 Around this time, a further blow to the station came when British Rail (as it still was then) declared a number of timetabled trains “permanently cancelled” due to a shortage of drivers – and one of these happened to be Pilning’s solitary morning service towards Bristol. This left the station with a service back from Bristol but no way of getting there (a foretaste of things to come some 30 years later!). Maybe they thought nobody would notice….. but they did, including one irate passenger from Newport who, on finding the scheduled train cancelled, stormed up to the ticket barrier with his bulky luggage and demanded that an additional stop be put into another service to drop him off at Pilning. As a result of this incident and an equally irate ensuing correspondence, British Rail eventually agreed to make the extra replacement call at Pilning permanent, though you had to ask the Guard to stop the train there if you wanted to get off and stick your hand out if you wanted to get on. However, BR were not always so accommodating – another complaint that the afternoon train had been cancelled, leaving somebody stranded on the platform, produced the curt reply that when this happened there were - and would be - no arrangements to stop another train there. So much for Customer Service! Another example of BR’s wholly negative attitude came when doughty campaigner Jonathan King produced his own posters advertising the station and its service and put them up around the village to encourage people to use it. Far from writing to thank him for his efforts, BR management demanded that he took them down and refrained from doing such a thing again on pain of legal action. Sadly Jonathan is no longer with us, having passed away in 2014, but his valiant campaigning efforts on behalf of the station and its community are commemorated in a memorial plaque which was mounted on the brickwork of the station footbridge (of which more in a moment). Pilning then embarked on a further period of slumbering obscurity during which its virtually-unusable service caused it to slide further down the National Station Usage table, another blow coming in 2006 when the Monday-Saturday service was further slashed to Saturdays Only. Things could hardly get worse, could they…..? Oh yes, they could, and they did so in 2016, when it was discovered that Network Rail proposed to demolish the station footbridge to make way for overhead wires as part of the South Wales Main Line electrification project. The bridge would not be replaced as this was judged not worth doing on cost grounds, and suggestions to raise it up were brushed aside. 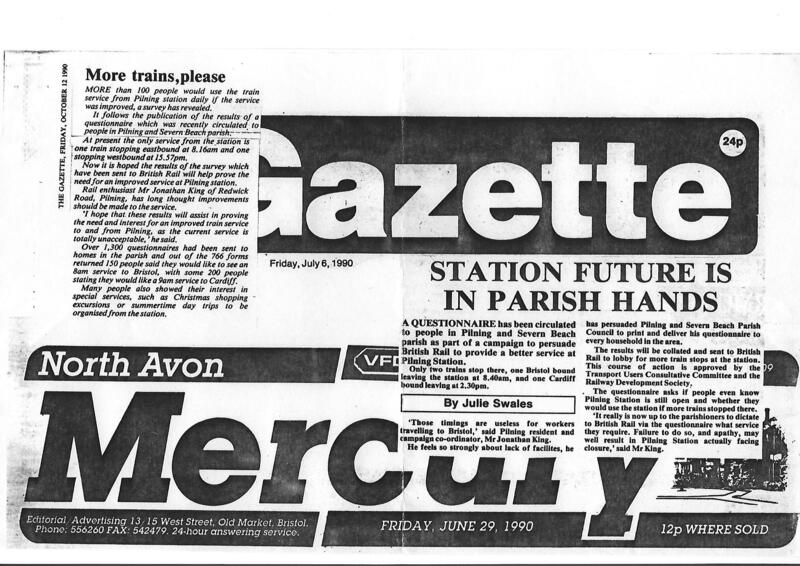 Moreover, this plan was being sneaked through on the quiet as a “Minor Modification” to the station, requiring minimal consultation with local people or their representatives, many of whom knew nothing about it. How can such a drastic alteration, cutting off access to one platform and rendering the service one-direction-only, possibly be classed as a Minor Modification? Well, the legislation classes this as anything which does not prevent the provision of “a train service”. It doesn’t say “a train service in both directions”! Despite strong and vocal protests by local people, the Friends of Suburban Bristol Rail Services and the station’s own User Group, and appeals to MPs and Transport Secretary Chris Grayling, the demolition went ahead and on November the 5th, 2016 - with a Bang! in the shadow of exploding fireworks - Pilning became a one-direction-only station. The only concession to common sense was the provision of a second eastbound train at 13 34, the idea being that people returning from Bristol could catch a train that would whizz through Pilning’s now-unusable westbound platform, go through the Severn Tunnel into Wales (! ), change at Severn Tunnel Junction and come back again. However, as well as taking much longer, this only gave them half the time in Bristol that they had had previously so it was hardly an adequate replacement. Campaigners continued to press for a later service in addition to the 13 34, which was already gaining in popularity with locals and visitors alike. GWR eventually announced that from January 2018 Pilning would gain a service at 15 34 – but that the 13 34 would be withdrawn, a ludicrous, mean-spirited and totally unnecessary decision given that it was stopping there without causing any operational problems and was proving popular. Moreover, with both trains in the timetable, it would be much easier for rail enthusiasts and other visitors to travel to Pilning, have a couple of hours in the nearby Plough Inn for lunch, and catch the train out again. The pressure is therefore being stepped up to get the 13 34 reinstated in the May 2018 timetable. 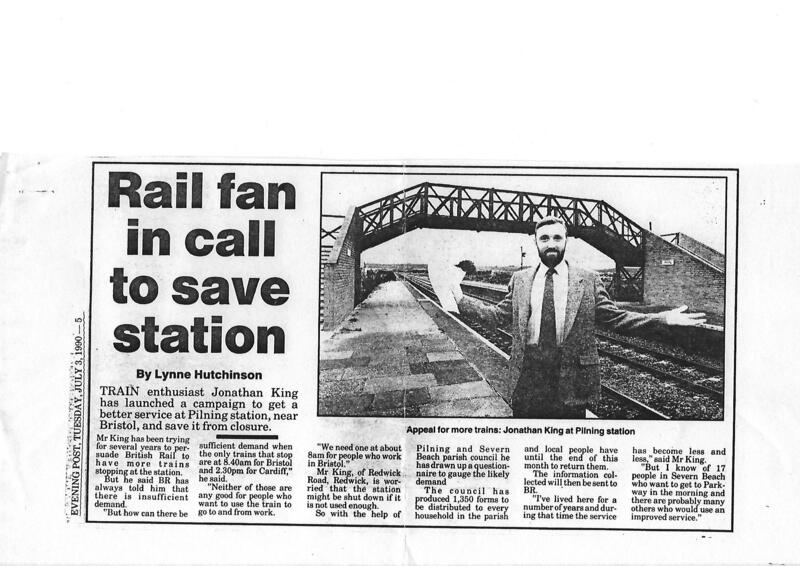 Other campaign issues include getting the station’s lighting reinstated so that trains can once again call after dark, and for a train towards Bristol during the Monday-Friday morning peak to enable local people to get quickly to work or college (more on this in the "What We Do" section). You might think that these latest setbacks would have sounded the station’s death knell – but you’d be wrong. On the contrary, they have focused attention on the station, the cynical abuse of procedures that allowed this to happen, and the potential – even the pleasure – of using it for Saturday day trips, returning to Severn Beach under an agreement which means that return tickets issued from Pilning are also valid there. Usage of the station is actually going up, boosted by the additional journey opportunities offered by the new lunchtime service and the initiation of the #PilningGrandSlam challenge, which offers a fun way to spend a Saturday morning and still leave time to do other things later on (like sitting at the Plough Inn telling happy stories from your #PilningGrandSlam travels or drowning the sorrows of an unlucky Gold run). The station received additional publicity when it was featured by the nation-wide #AllTheStations video project (see the link on this site), plus TV coverage. Its User Group is steadily gathering support, led by the indefatigable Olga Taylor and friends (wave to the Brigg Line and other small but significant railway user groups and individual passengers from around the country and even overseas, who offer their support on Twitter, as well as liking and retweeting what we have to say). The Plough Inn down the road is also an enthusiastic supporter – working together, both scored a notable success when GWR agreed to stop a Sunday service at Pilning for the first time in decades to pick up overnight campers from the pub’s August Saturday music festival, a small but significant example of what can be achieved. Moreover, Jonathan King’s memorial plaque is being reinstated on the station after going missing for several weeks following the demolition of the footbridge. His memory endures – and the Battle for Pilning goes on!